There is something about beans and rice that I find very comforting. We can make a whole meal out of a simple dish such as this. I like to eat beans and rice just about any way, but this is probably my favorite. The recipe is inspired by several that I’ve tried over the years, including one from Latin American Cooking Across the USA, by Himilce Novas and Rosemary Silva. This version uses more tomatoes than the traditional Moros y Cristianos, but we like the extra juice. Cooking in the slow cooker makes it a really easy meal. Stir together all ingredients (minus the salt and bell pepper) in the slow cooker. Cover and cook on high heat setting 8 hours or more, until beans are tender and most of the liquid is absorbed. About 30 minutes before serving, stir in the salt and the chopped bell pepper. Continue cooking on low until ready to serve. Remove bay leaves. Serve beans over cooked rice. You can use 2 (16 ounce) cans of beans instead of dried beans. Drain them well and add to the slow cooker. Omit the 28 ounce can of water. Reduce the cooking time to 4 to 6 hours. love,love,love red beans and rice! Although not always convenient I love the homely feel of slow cooked food. Your beans look delish, the photo of them glistening on top of that bed of rice, yummo! That looks fantastic! I’m hungry just looking at it. We’ve been looking for good yummy slowcooker recipes– thanks!! Emily: I love red beans and rice, too! Jenjen: Thanks! Nice to meet a fellow food blogger from Australia. We haven’t been down that way in a dog’s age. Michael did a bike ride from Melbourne to Canberra to Sydney in 1988 and I spent 10 weeks there on summer holiday in 1992. Gotta get back down there sometime! Jenn G.: Thanks! We have a couple slow cooker recipes here, including Michael’s vegetarian chili (which we love). I printed out this recipe a long time ago and have made it a few times since. I like it better every time! It is SO GOOD. I tweaked it slightly given what I usually do/do not have on hand (no red wine vinegar and chili flakes instead of the can of chilis). Anyway, thank you so much for a fabulous recipe. I used to think I didn’t like dried beans so the fact that this recipe is one I actually crave says quite a lot. Thanks! I’ve made this many times. Sometimes black beans, sometimes red. I’ve used bacon, chili powder, whatever, and it’s always a hit. This time I’m putting in wild rice at the end, wish me luck! Larry, I’m so glad you like it. Let me know how it turns out with the wild rice. The wild rice added a great nutty flavor to the beans. Add cayenne pepper to taste. It doesn’t get any better. This is great going through your blog and finding such nice recipes! I turned off the crockpot at about 7:30am. The boy thinks we’re weird because we’re “eating beans for breakfast.” I told him, “This isn’t breakfast. This is tasting.” He said he didn’t want any, but I could see the foodlust in his eyes. Nine-year-olds, they know nothing. I am going to try your Black bean and rice recipe. Cubans.Excellent food.You also have a very nice web site. Making this again today. It makes excellent leftovers for lunch. Thanks for the recipe. 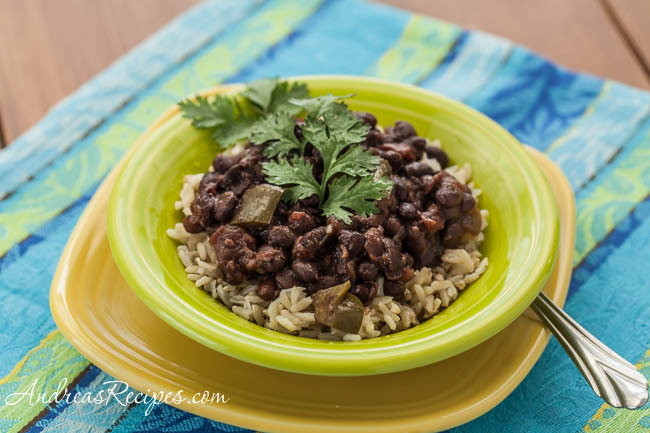 My mother’s Cuban black bean recipe adds some cinnamon, more vinegar, and lots of lime juice. I tend to add the vinegar and lime at the end so it wont cook out/ Some people have different tolerances of the sour so I might leave the cut limes for the diners to squeeze on their meal. Tonight I am making my first slow cooker version…. Sorry for the extra-late follow-up, but I’m making this again today. We’re going to a friend’s house for a lunch pot-luck today, and I’m making a double batch of these awesome black beans. My kids still are a bit wary of it, but the rest of us love it. I was so excited to make this for my son. I put them on at 11 pm last night (Monday) and they’re still cooking (it’s 4:50 pm) and the beans are still firm. I would recommend soaking the beans ahead of time for anyone who is going to try this recipe. A pinch of baking soda reduces the acidity in the water and tomatoes allowing the beans to cook and soften. This is a necessity with my hard water when cooking dried beans. Hi Lori. I’m sorry to hear your beans didn’t turn out. I’m not sure what happened with your batch. I’ve never had a problem with the beans not cooking up in the allotted time. Thank you so much for this recipe. I love cooking with the slow cooker, and have lost count of the number of times I have made these. YUM YUM YUM. I sometimes also add some smoked sausage since my husband thinks he needs meat at every meal. This one is definitely in the winter rotation. Glad to hear you like them, Kara! Making this for the 1st tiome today!!!!! can’t wait to eat!!!!! I am new in the kitchen. I am cooking them as I type, I hope my hubby and baby girl like it. It smells good so far. I used a variety of tomatoes from our garden for the diced portion, and substituted the bell peppers with a combination of homegrown red cowhorn peppers and a smaller amount of Jalepeno’s to make up the difference for the bells and green peppers … should have a nice kick! thanks again, the last time I had this, I was with a family that absolutely made the best black beans, they were from Cuba, and I remember the whoever was in charge of the beans had already learned to cook the beans in the slow cooker … I think you’re on to something! I will report the taste in the morning, the kitchen is nicely aromatic right about now! Hi T. Jasmine rice is our everyday rice and that’s what we eat with these beans. I hope you enjoy the beans and rice as much as we do. Hi Brian. I don’t soak the beans, you just need to give them plenty of time to cook. I am a cooking novice and I found this recipe very easy to follow. I was making it for a very large crowd, so I doubled the amount of beans b/c I couldn’t find anywhere in the recipe where it indicated how many servings one bag made. I think I over did it though, so there will be lots of leftovers. Haven’t served it yet to the crowd, but I have taste tested of course and it tastes delicious. This will be a recipe that I will definitely repeat, maybe add some chicken or sausage next time? How do you think chicken would taste with it as I am not a huge sausage fan, but my husband is? Hi Christina. I’ve never tried it with chicken, but it would probably taste fine with some chicken legs or thighs. I have made this recipe several times now and now people are asking me to make it when we have potlucks. I was asked to prepare it for 60 people and I am clueless as to how much to make. There will be other food but this will be one of the main dishes being served. How many batches do you think I should make for this many people? Also I wanted to let folks know that I always cook the full recipe (it’s just my husband and me) and I portion out the left overs in food sealer bags, seal them up and freeze them. I have left them in freezer for over 4 months and the taste great. Someone told me that if you use the canned beans-which I don’t – then defrost it the beans are mushy, but w the dry beans they aren’t mushy at all. Very fresh and a quick wat to fix a nice hot meal. I have even frozen left over cooked rice and it comes out fluffy and fresh tasting. Just dug out this recipe. I used to make it a lot and really like it. I just recently started Weight Watchers and need to figure out how many servings, or cups it makes. I don’t want to make it and find it is a huge amount of points. I have made this numerous times with a can of Pastene Kitchen Ready CHUNKY. Today, right now, I have it in the crockpot with a little medium hot chili powder. I serve it with River rice. Hi- just wanted to say that this is my bookmarked, go-to black beans recipe- it’s perfect every time! For the second year in a row I’ve thrown in the hambone from Easter dinner. YUMMMM! Can’t wait for burritos when I get home from work tonight, and a week’s worth of black beans & polenta with poached eggs, tacos, and other yummy ways to use them up. Thanks for a great recipe! Hi, I found this through another blog, Slow Cooker from Scratch (Kalyn!) Wanted to say both my husband and I *love* this recipe, and pretty much had it *every day* this past winter for our lunch. We never tire of it, and it’s so easy to make up at the beginning of the week. Sometimes I add churico sausage, or some chunks of Columbian cheese; we’ve even cut up pepper jack cheese sticks on it and heated it up! Soooo Sooo good!!! Thanks for the recipe!! I made these this weekend, mixed with rice, and served them at my nephew’s graduation party with the walking tacos my SIL was serving. It was my first time cooking dry black beans, and they turned out amazing! The mix also held up well all afternoon in the slow cooker on warm. For those wondering, this made 8 cups of beans and is 1SP per cup on the Weight Watchers Freestyle plan (for the beans only).